→ Showcase #58 (09/65) Enemy Ace - The Hunters... And The Hunted! → Our Fighting Forces #87 (2) (10/64) The Only Survivor! → Our Army At War #83 (1) (06/59) Sgt. Rock - The Rock And The Wall! → Captain Storm #7 (1) (05/65) Capt. Storm - A Bullet For The General! 3 10/67 1,5 FF (0,23 €) 22 / 18 / 13 / 10 / 3,9 Mission X ! → Captain Storm #5 (01/65) Killer Torpedo! → Captain Storm #6 (1) (03/65) Capt. Storm - Medals For An Ocean Graveyard! → Our Army At War #187 (1) (12/67) Sgt Rock - Shadow Of A Sergeant! → Our Army At War #97 (1) (08/60) Sgt Rock - What Makes A Sergeant Run? → Our Army At War #157 (1) (08/65) Sgt Rock - Nothin's Ever Lost In War! → Brave And Bold (1°) #52 (02/64) Sgt Rock, Haunted Tank, Johnny Cloud & Mlle Marie - Suicide Mission! Save Him Or Kill Him! → Our Army At War #191 (1) (03/68) Sgt Rock - Death Flies High! → Our Army At War #167 (1) (05/66) Sgt Rock - Kill One... Save One! → Our Army At War #175 (1) (01/67) Sgt Rock - TNT Letter! → Captain Storm #15 (1) (09/66) Capt. Storm - My Enemy... My Friend! → GI Combat (1°) #117 (1) (04/66) Haunted Tank - Tank In The Icebox! → Star Spangled War Stories (1°) #147 (10/69) Enemy Ace - A Grave In The Sky! 9/ Sergent Rock - Arrêtez le carnage ! → Star Spangled War Stories (1°) #150 (1) (04/70) Enemy Ace - 3 Graves To Home! → Star Spangled War Stories (1°) #151 (1) (06/70) Unknown Soldier - They Came From Shangri-La! → Our Army At War #153 (2) (04/65) Enemy Ace - Flaming Bait! → GI Combat (1°) #121 (1) (12/66) Haunted Tank - Battle Of Two Wars! → Our Fighting Forces #124 (1) (03/70) Losers - Losers Take All! → GI Combat (1°) #122 (1) (02/67) Haunted Tank - Who Dies Next? → All-American Men Of War (2°) #94 (1) (11/62) Lt. Johnny Cloud - Be Brave, Be Silent! → Star Spangled War Stories (1°) #152 (1) (08/70) Unknown Soldier - Instant Glory! → Star Spangled War Stories (1°) #152 (3) (08/70) Enemy Ace - Rain Above... Mud Below! → Star Spangled War Stories (1°) #154 (1) (12/70) Unknown Soldier - I'll Never Die! → Our Army At War #215 (1) (02/70) Sgt Rock - The Pied Piper Of Peril! 10/ Le dernier Tank ! 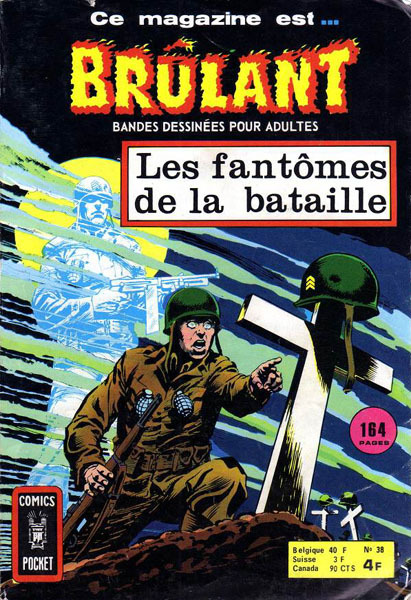 11/ La plume du chef pour "Petit Ours"
→ GI Combat (1°) #142 (1) (06/70) Haunted Tank - Checkpoint... Death! → Tomahawk #128 (1) (05/70) Rangers... Your 9 Lives For Mine! → Tomahawk #129 (1) (07/70) Treachery At Thunder Ridge! → Star Spangled War Stories (1°) #163 (1) (06/72) Unknown Soldier - Kill The General! → Our Army At War #244 (5) (04/72) USS Stevens - What Do They Know About War? → All-Star Western (2°) #11 (1) (04/72) Jonah Hex - The Hundred Dollar Deal! 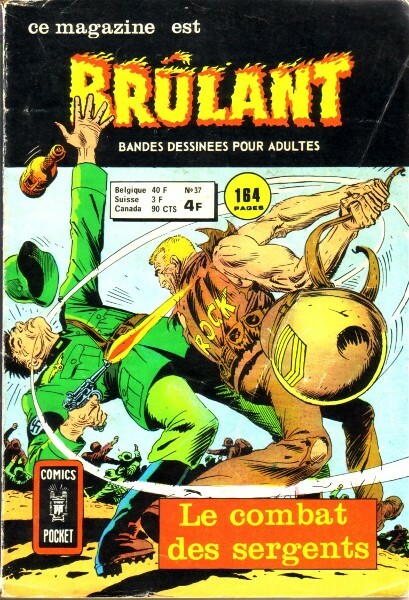 → Weird War Tales (1°) #19 (11/73) The Platoon That Wouldn't Die!